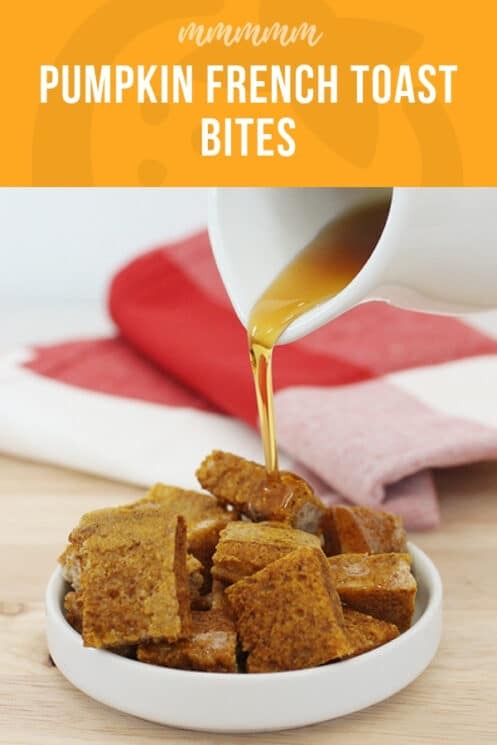 Looking for a little finger food for breakfast, look no further than our Pumpkin French Toast Bites! My kids loved the pumpkin pie flavor of this french toast. 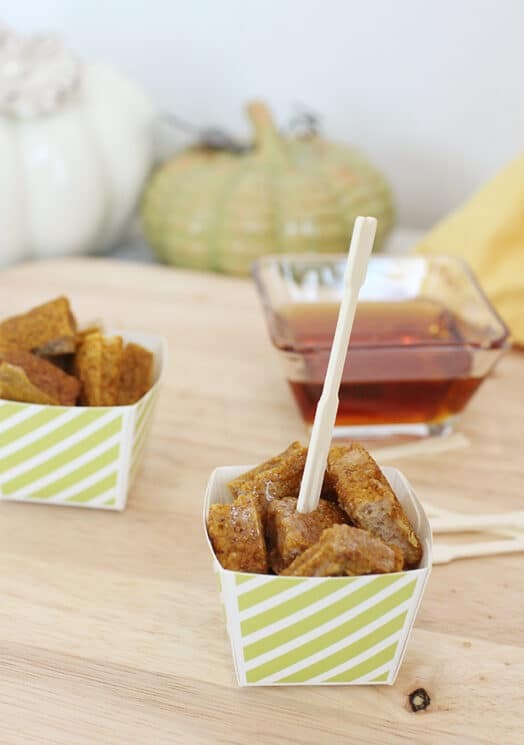 These little Pumpkin French Toast Bites can be finger food, on the go breakfast, or eaten traditionally. We combined our love for French toast with our love for pumpkin, and came up with these little jewels. The little breakfast squares got a thumbs up from my husband as well (who tends to be hyper honest when he doesn’t think something tastes good). French toast has been a favorite breakfast of ours for a very long time. But it never has to get boring, and with just a small swap of the spices, it can taste drastically different! I included below 10 ways we make french toast taste a little different than this pumpkin variety. We always teach, if your kids don’t like a food, try it a slightly different way and see what they think! For today’s flavor, and to celebrate the cooler weather, we used pumpkin pie spice. Pumpkin pie spice is just a combination of cinnamon, ginger, nutmeg, allspice, and cloves. I’ve made my own pumpkin pie spice (Pioneer woman has amounts here), but you can now purchase it in the grocery store already done for you. We also added some pumpkin puree. Pumpkin puree doesn’t add much flavor to your dishes, but it does add some nutrients like vitamin A, which is always a good thing! We have 10 other French toast variations on the blog! Here they are from most recent to oldest! Flax French Toast I love the addition of flax to this one! Flax adds extra fiber and healthy fats that kids need. 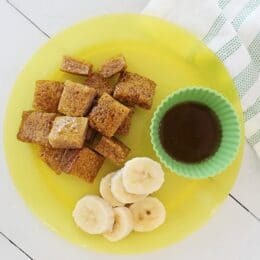 Banana Baked French Toast Baked french toast is a different way to do french toast that doesn’t require you to be standing over a hot skillet to make happen. Warm Pears and Baked French Toast Another fall fruit, pears! This french toast can be served with warm fruit instead of syrup. Freezeable French Toast Sticks Once freezable french toast sticks became a popular grocery store purchase, we made our own! So easy on a busy morning. Blueberry French Toast Casserole Mostly, the blueberries happen for us in the spring, and this french toast casserole does NOT disappoint! Carrot Cake French Toast Sticks One of our first recipes, adding carrots is a great way to get a small amount of veggies in at breakfast. Stuffed Berry French Toast DECADENT! We make this stuffed berry french toast when I’m feeling fancy! Nut Crusted French Toast Adding nuts to french toast is a great way to increase the fiber, protein, and healthy fats! Mini French Toast Casserole Single serving french toast casseroles is fun! I created a little graphic for this one so your kids can make it themselves. Peach Cobbler French Toast Sticks Another fall favorite, peaches! So, let us know which French toast you’re going to try this fall, and if pumpkin french toast is on your meal plan! Spray baking sheet with cooking spray. Preheat oven to 400 degrees F.
Add pumpkin, eggs, milk, spice and vanilla to a mixing bowl and whisk well. 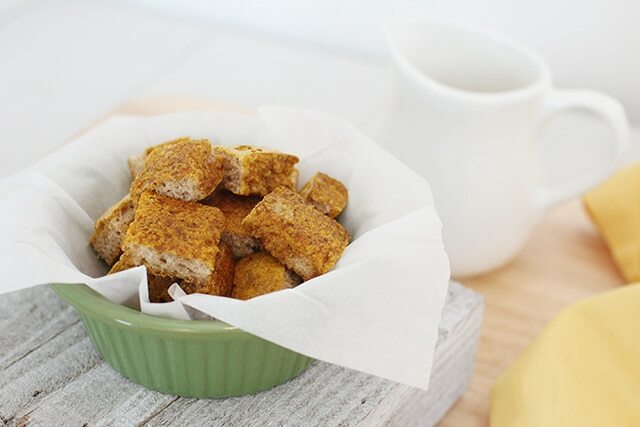 Dip each piece of bread into the pumpkin mixture and place onto baking sheet. Bake for 10 minutes, flip and bake for an additional 10 minutes. Serve with maple syrup for dipping and banana slices on the side. oooooh! I think I will make these tomorrow morning! YUM! These sound very good!! And I bet you can get creative on what else you could put in the middle! I was thinking the same thing!! Peanut butter and bananas maybe? Yum! These look great! You are always so creative! Yes, PB & Banana sounds fantastic! We’ll have to try these soon. These were really good! The whole family liked them. The only suggestion I could make is greasing the baking dish. I used a glass dish and the directions didn’t say to grease, but I should have known better. They were just a little hard to flip and the dish was a mess. Great recipe, though! Thanks LIsa- I’ll add that! I just made these for a 3rd time. I make them in big batches and freeze them for my kids breakfast at Daycare. This time I mixed a can of pumpkin with a container of whipped cream cheese and cinnamon for the filling. They loved them!